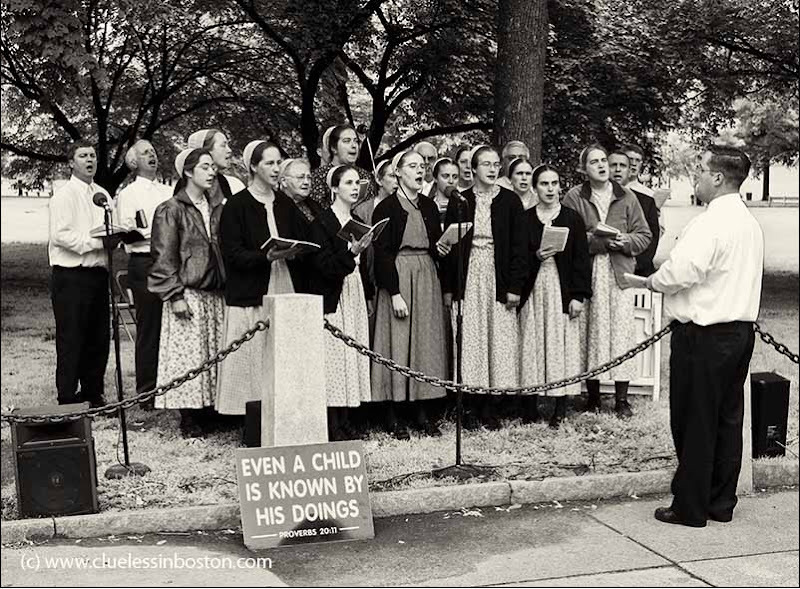 A group of Mennonites from Pennsylvannia were on the Boston Common yesterday singing and evangelizing for their faith. Their singing was quite nice, but all I came away with were a few pictures. A fellow citizen seemed unfazed by the visitors and peacefully slept on a bench under the inspirational(?) statue of Industry. Location: Parkman Plaza on Boston Common, next to the Visitor's Center. Views of the Mennonites I captured two years ago can be seen: here and here. The second shot is out of time, like a 60ies picture! Malyss has already analysed these extraordinary shots. They belong in a book. That first shot is metaphorical in nature. Wow! The things we stumble upon. I am just enamored with the first shot, there is so much to take in! 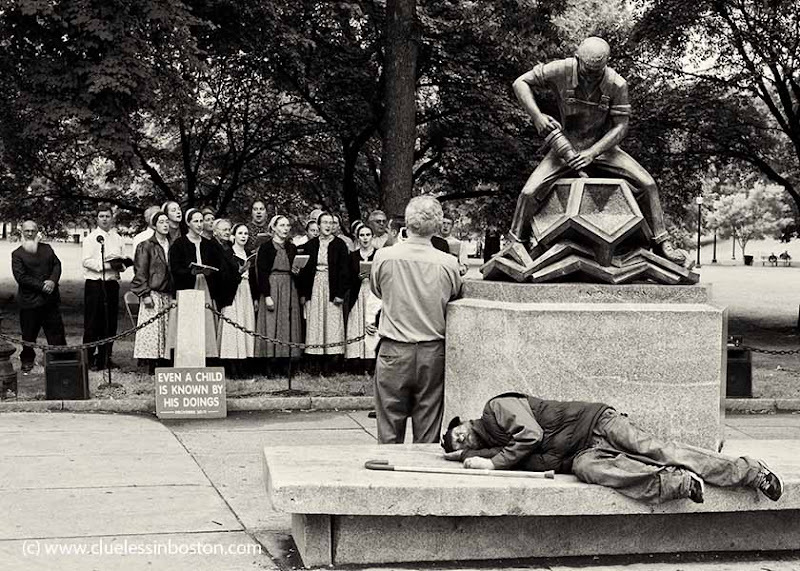 The statue, the sign, the sleeping man. Black and white seem just right for Mennonites, to put them in color would be wrong somehow. Thank you for brining this to us! Like the top shot, quite a few items of interest. On the Mennonites; I just find it strange today, but different strokes for different folks. I love how opposing these two photos seem. the first is drawn into modern times by the presence of the sleeping man but the second could have been taken fifty years ago. My friend is Mennonite in her beleifs but does follow many modern pursuits. Both these shots are great but that top one is simply fantastic. I absolutely love it. That's very interesting to me! I've never encountered any Mennonites here in Montreal. Thanks for sharing. I thought the sleeping man was part of the performance until you told us different. What a capture! It's so perfect that you would think it was set up! Converting Bostonians from sin? Hopeless. The top shot is wonderful, made special by the unfortunate form of the lying man. It's all been said above, just one more thing, you totally inspire me to keep experimenting with the black and white, the effect it creates is so right for the image, in your photos anyway!! There is an Amish community about 20 miles east of Tulsa in Chouteau, and the nearby communities of Inola and Mazie. Several of the families will host a dinner in their homes for small groups. I have been part of several of these with church groups. They raise "home cooking" to a new level. They are good people. I remember your earlier mennonites. Thought provoking compositions here.